My previous two posts, The Propaganda Machine Turns Once Again and Thank You BBC, were in response to a report in the Independent headlined, “Nicky Morgan orders review on home schooling amid fears children having minds ‘poisoned’ by radicalised parents”. This article was published on Sunday 20 December 2016. In my first post I encouraged readers to write to their MP asking them to ask the Rt. Hon. Nicky Morgan MP, Secretary of State for Education if there was any truth in the report. This is something we did ourselves at the start of January, and yesterday (12 Feb.) we received her reply which has been forwarded to us by our own MP, Owen Paterson. A scan of her letter is below; the full text follows the image. 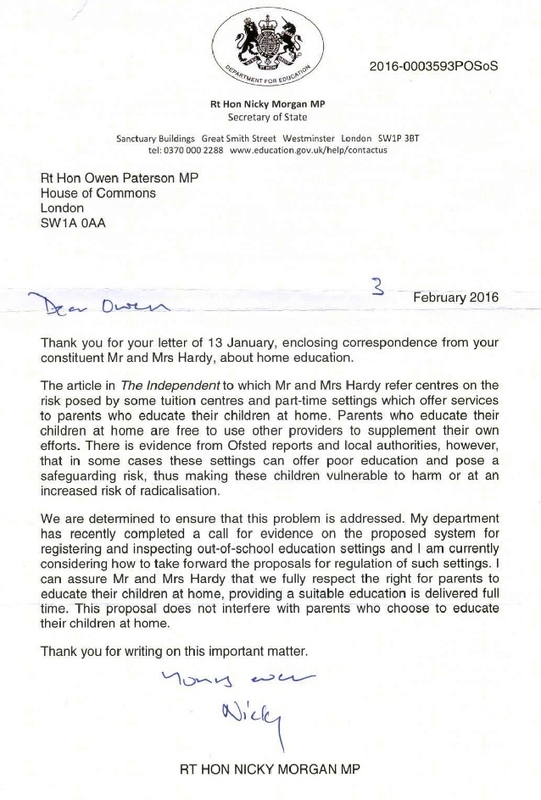 Thank you for your letter of 13 January, enclosing correspondence from your constituent Mr and Mrs Hardy, about home education. The article in The Independent to which Mr and Mrs Hardy refer centres on the risk posed by some tuition centres and part-time settings which offer services to parents who educate their children at home. Parents who educate their children at home are free to use other providers to supplement their own efforts. There is evidence from Ofsted reports and local authorities, however, that in some cases these settings can otter poor education and pose a safeguarding risk, thus making these children vulnerable to harm or at an increased risk of radicalisation. We are determined to ensure that this problem is addressed. My department has recently completed a call for evidence on the proposed system tor registering and inspecting out-of-school education settings and I am currently considering how to take forward the proposals for regulation of such settings. I can assure Mr and Mrs Hardy that we fully respect the right tor parents to educate their children at home, providing a suitable education is delivered full time. This proposal does not interfere with parents who choose to educate their children at home. Thank you for writing on this important matter. What then are we to make of the Minister’s reply? I can assure Mr and Mrs Hardy that we fully respect the right for parents to educate their children at home, providing a suitable education is delivered full time. This proposal does not interfere with parents who choose to educate their children at home. I suspect that the reference to “delivered full time” is more in the context of unregistered schools than any legal definition of “full time”, for none exists especially with reference to home education. Given that clarification, it is good that the Education Secretary has restated that the present government fully respects the right of parents to educate their children themselves. I have posted Nicky Morgan’s reply here because it is the first comment I know of from her since the Independent reported that she had ordered a review of home education. I hope that we were not the only ones to write to her over this matter, and I suspect others will receive a similar response if they have not done so already. This does not mean however that the HE community can relax; there is plenty of work still to be done educating local authority councillors and their staff on the legal status of home education. This entry was posted on 13/02/2016 at 3:34 pm and is filed under Home Education UK. You can subscribe via RSS 2.0 feed to this post's comments. Responses are currently closed, but you can comment below, or link to this permanent URL from your own site.